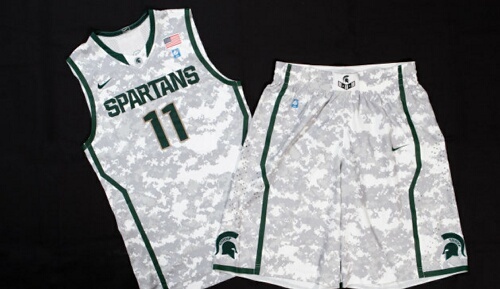 The Michigan State and North Carolina men’s basketball teams will wear school-color camouflage-style uniforms to honor the military during their Nov. 11 Veterans Day clash aboard the aircraft carrier Carl Vinson in San Diego. On Monday, the Spartans showed off the camouflage-patterned unis they’ll wear — white with a light green pattern and bordered with the school’s traditional dark green. North Carolina’s design, unveiled Oct. 26, will feature a deep blue camouflage pattern over the traditional Carolina blue. 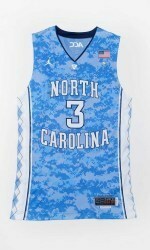 UNC's uniform for the Nov. 11 game. // Photo courtesy of the University of North Carolina. The back of UNC's uniform. // Photo courtesy of the University of North Carolina. Just how much money are they spending on this waste of time? There are 45 plus sailors in my command anxiously waiting for our ERB results to find out if they are getting the boot so the Navy can save money. Waste and mismanagement of funds is killing the services. “Its diffrent funds.” Right! Bottom line is that it comes out of taxes and shows as defence spending. We deserve better. First off AE1, just because the event is taking place on a carrier doesnt necessarily mean the Navy is doing the spending. Actually, i think it would be safe to assume that the Navy would be greatly beneficial from hosting a game like this. Not only will this be a great way to help recruiting but it will also bring in all sorts of business to the base that day. Also, who’s said that the Navy isn’t getting paid to host the game? We dont know the money behind it, so don’t assume its a waist of money. Its a great and fun idea that will bring great morale to the Vinson’s sailors as well as other sailors through out the fleet. So the fact that this will greatly boost morale, increase base business for atleast a day, and boost media time for recruiting, all greatly out weigh your opinionated assumption that this is a waste of money. Its being advertised as the QUICKEN carrier classic. We arent putting up any money. The NCAA, ESPN, and sponsors are mearly using our carrier as a medium to highlight their support of us in uniform. I cant wait to watch. Stop whining. No, the Navy IS putting up some expenses with this. Look at the work we did amongst the ship’s company? Not that the embarked staffs helped, because they DID NOT. Yes, the Navy is spending $$, while showing a lot of Sailors, from this ship included, the door. Great way to do business CNO and SECNAV. But I guess if you can play basketball, it makes it worth it. Whatever the Navy spent in terms of manpower time and so forth to support the setup/takedown was absolutely DWARFED by the national exposure the broadcast brought the Navy, in my view. Did you see how much airtime the Navy got in addition to the game/setting? Every ESPN commercial cutaway — and there were dozens — amounted to a Navy recruiting ad. One of these was a powerful 2-3 minute feature on carrier operations that ran before the game itself started. I haven’t seen the ratings as yet but this was a much-hyped and probably widely viewed game. This was a PR coup, no question about it. Look at the big picture. Speaking of raising money for the Navy. How and were can I buy the Shorts or Jersey’s for either team? They are sweet. I want a pair and so does my son.